Nearly 15 years later and Hollywood is finally giving Operation Desert-Storm its place on the big screen, and on March 7, 2006 on home DVD players. This film from Universal, starring Jamie Foxx and Jake Gyllenhaal, is based on former Marine Anthony Swofford’s memoir by the same name. This film follows a naïve young recruit through the trials and tribulations of boot camp (think Full Metal Jacket but with Jamie Foxx instead of R. Lee Ermey), on to the boredom, uncertainty and fear of combat in the desert. This film at its heart is about the soldiers, the young men and women who spent day after day in the desert awaiting the “mother of all battles”. While this film is certainly only based upon one soldier’s memoirs and experiences, and therefore should be viewed with that in mind, I feel that there are still many things to be seen that apply to the all of our modern war fighters. However, the casual viewer may find themselves fighting boredom at times. As designed, the action is rare, seemingly designed to immerse the viewer in the futility of waiting along with the soldiers. Those who aren’t military buffs or those looking for an action packed shooter need to look elsewhere as this movie may disappoint. This film does a good job of depicting the many unique factors that face our modern military. We follow Swofford (Gyllenhaal) as he is transformed from a raw recruit into a trained, technically proficient killer and prepped for war. We then witness the toll, both physical and mental that is taken on Swofford and his fellow warriors. Primed and ready to go, they are suddenly faced with the uncertainty of waiting for an order that may not come, the order to put their training to use on the fields of combat. The soldiers have nothing other then themselves and their love and concern for one another to keep them going. They are far from home, awaiting uncertain orders, facing the possibility of chemical weapons and in some cases defending a cause they don’t fully comprehend. It is important that the viewer take this cynical perspective into account, because surely this was not the experience of all the troops. The soldiers in the movie struggle to find their own identity and understand how they are viewed by the military hierarchy and the civilians at home. At one point, when Vietnam-era music is played by coalition troops we hear: "This is Vietnam music. Can't we even get our own music?" 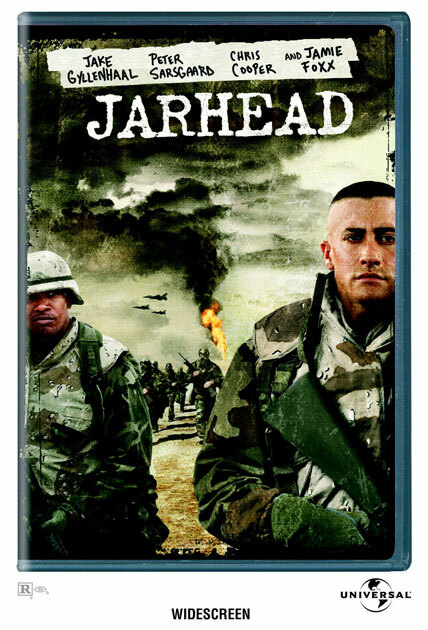 Directed by Same Mendes (American Beauty, The Road to Perdition), Jarhead delves into the soul of America’s fighting forces: the young men out there, with feet on the ground and sand in their faces. The timing of this DVD release could not be more poignant. Our newspapers are filled everyday with tales of our young men and women currently serving in Iraq. While based upon a different time, this film gives the viewer a small glimpse into the uncertainty and the brotherhood that our troops in Iraq are currently living. This window into what our troops my be facing in daily life (let alone the daily combat operations) and the battles that many may be fighting inside their own heads as they struggle with the boredom, uncertainty, occasional absurdity of the “military” and fear that result from a military deployment to a war zone. In conclusion, although relatively narrow in scope I would recommend this film to anyone that would like a glimpse inside one soldier’s experiences during Operation Desert-Storm. While it may not be universal, and is by no means attempting to be a historical documentary, this film evokes the true spirit of our modern day soldiers and deserves a viewing! Please feel free to share your thoughts, good and bad about the movie. I work with an ex-marine who ragged on the movie nonstop talking about how there was no way a master Gunny would stop a sniper from taking his shot and so on. Keep in mind that this is a Marine who did not get to go over to D/S either and he only drove an Am-Trak when he was in. I reminded him that I was there as a 2nd Brigade 1st Infantry Division unit soldier also and that I was lucky enough to sit around waiting on orders I also hoped I would never get too. Sure I look back and wish I had gotten to see some action too. I think this marine was loooking for more of a "shoot em up, blow eveything in sight up and kill as many as you can" movie. D/S was primarily an Air Force (bomb the $^!# out of the place) and Tank/Bradley (come in and clean the rest up) war in my opinion. Most of the dead Iraqi tanks, BMP's and so on that we came across were already empty when hit. Most of those guys didn't want to fight in the first place. He changed his tune a little bit after I shared some of the things I saw with him but he is still stuck on this "gunny not allowing the sniper to take his shot" thing. I will be standing in my local Blockbuster at 10am to rent a copy when it comes out tomorrow. In concert with this review I understand Desert-Storm.com should be receiving some copies of the DVD to giveaway to our members! So be on the lookout for an update concerning this as I get more details! Who else has seen this movie? Lets hear from you! Haven't seen it as yet. I would like to though. I watched it last night with my wife. She couldn't believe some of the things she heard or saw and of course asked me if was really like that each time and I told her it was that and more. So many memories were brought back while watching Jarhead. I had some weird dreams last night because of it too. Wife said I made a lot of weird noises in my sleep (in fact that was a line directed at Swofford in the movie too). I don't remember most of my dreams last nite though...thank god. I expected a bit more action but that expectation is based on what I experienced as being part of a tank-heavy mechanized brigade with the 1st Infantry Division. They did a very realistic job depicting the dead Iraqi's in the convoy of vehicles trying to run away...I saw a lot of that on the Road to Basrah (Highway of Death"). Now I wish someone would make a movie depicting the US Army doing its thing over there and make it like 4 hours long...they could do it based on the 1st Infantry Division and our capturing of Safwan Airfield and Col. Moreno's show of force in advising the Iraqis to leave Safwan. That would be a great idea but then it would be too intense for a lot of people. The longer the movie, the harder it is to stay with it. If they should show all of the things that happened in a movie it might be too much for people to digest and understand. I'm going to rent it this weekend, how long is it, King Kong was 3 hrs. and it lost my interest after the first hr and a half. No Idea how long it is. Think I am going to go rent it though. I liked the Movie Article 99. That was a funny movie. Did you ever see the movie All the kings men, wasn't that about Desert storm, it's been along time since I've seen it, it was kind of a weird movie. It was about DS but I never got a chance to see that one. Gonna have to add it to my list of things to see. I rented it tonight and it was a great movie. I'd put it right up there with Full Metal Jacket as one of my favorites. I was in the Airforce So I like to see what it was like for other branches during D/S. My favoite part was when the Vietnam vet got on the bus at the end, but with this movie I had alot of favorite parts. I'd give it 2 thumbs up. I will let you know as soon as I get the chance to see it. I was going to watch it again, but I went to the Drag races instead. I had to have it back by 7pm, and the Las vegas race is on tonight. Three Kings was set in D/S but was more about a small squad finding and stealing Kuwaiti gold stolen by the Iraqis and saving a group of Kuwaitis, not much other than that. Jarhead was about a small group of Marines and their experience...or lack of. Courage Under Fire was about a female in D/S, her death and the medal of Honor she deserved. Each movie seemed to touch on some "personal" experiences of a few instead of the larger picture. They were able to do what I suggest with Full Metal Jacket, Plattoon, and so on. A bigger story (can be done in 2 hours) could be told out a larger part of the war and still keep people interested. Spend 10 minutes introducing the characters (touch on the battalion or brigade or even the division just a bit), spend another 20 going over the "how it got to the point of becoming a war" then an hour going over different incidents (going through the breach, showing the trip across Kuwait and into Iraq and the small & quick battles along the way) the face to face Ultimatum Col. Moreno gave to the Iraqis to leave Safwan and end the movie with the Cease Fire negotiation on end of the Safwan Airfield runway. maybe close the film out (credits rolling) with the soldiers flying home and being welcomed. You know a lot of people would watch it, see how good the 3 I listed up top did. If I only knew what I know now, I'd have dropped a couple grand on a top end Digital Video Camera and a few hundred if not thousand on lots of media and video'd everything from the time I landed in Saudi until I walked into my barracks on Ft. Riley. Some editing and my video would be on IFC (Idependent Film Channel) and maybe right to video stores. You know that Hind sight and the 20/20 thing! We didn't have the technology that they have today, remember how huge video recorders were then, they were shoulder held. I wish I would have set back and looked around a little more, I was 19 and couldn't wait to get the hell out of there, I kind of have forgotten about alot of things, luckily I took a few pictures. When I see a photos of KFIA I start remembering alot of things that I had forgotten totally. I'm glad I found these forums, because I never had anybody to talk about this stuff to.